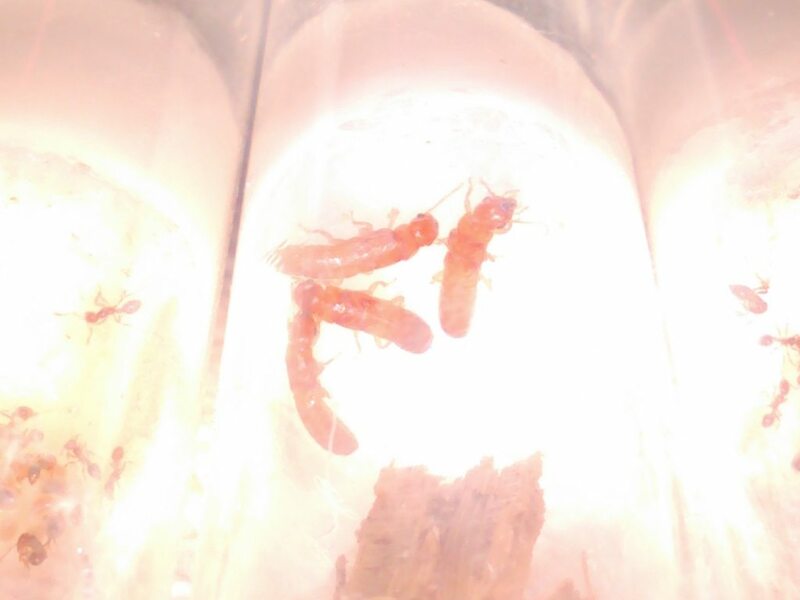 Hey there, I just found these four termite alates last night in northeastern Florida at night by an outside light. (I found eight of them, but only kept these four as each pair consisted of one termite following closely behind another, which termites do when the king follows the queen to find a suitable nesting site.) I put them in a test tube set up with some damp wood so they can eat. (Cellulose.) These termites are about twice as large as the subterranean termite king and queen I currently have which are doing well. They are also more of an orange color as opposed to the subterranean termites I already have. 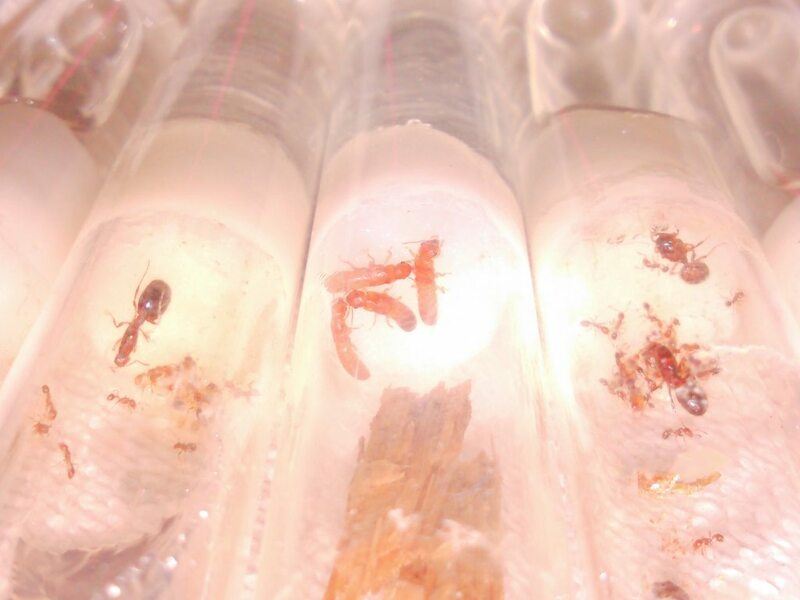 In the images, I have them next to some Solenopsis invicta queens and nanitic workers for a size comparison. Since are many species of termite in Florida, including some invasive ones, I was wondering what species of termite these are. Are they the subterranean, damp wood, or dry wood variety, and exactly what species are they? Thanks in advance! Edited by AntswerMe, May 13 2017 - 1:33 PM. The photos are a bit to bright to ID. Those are some nice Solenopsis though. Edited by Martialis, May 13 2017 - 3:57 PM. Yeah, I had the phone light on. I'll take some more pictures without the light. Edited by AntswerMe, May 13 2017 - 6:03 PM. Edited by AntswerMe, May 13 2017 - 7:00 PM. Oops, it did the thing, oh whatever, at least the pictures are there. Are they yellow? I can't really tell. If they are, almost certainly Formosan subterranean termites. Edited by Vendayn, May 13 2017 - 9:15 PM. I've also been seeing these large orange termites at night. They look cool. Still fed some to my Camponotus though. If these are orange (and not yellow) and large, they are actually more likely to be dampwood termites and not Formosan subterranean termites. They looked yellow in the pictures, but orange would almost certainly make them dampwood and especially if they are big. Which Florida does have dampwood termites. 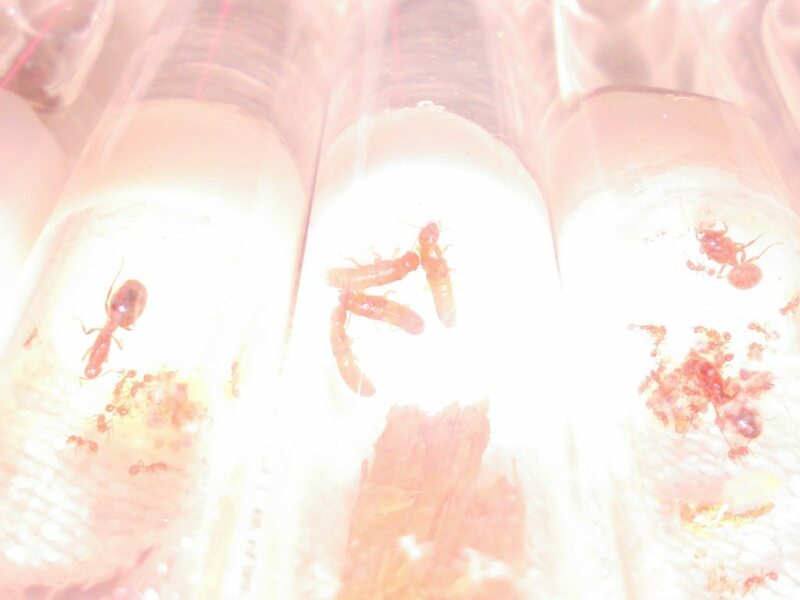 (actually didn't notice the size of the termites compared to the Solenopsis queens. Yeah, those are Dampwood termites. While not Pacific dampwood termite size, they are still one of the largest termite species in North America. Nice, they are really awesome. Can be hard to keep as they need specialized conditions. I actually do not have any advice there, you may want to read up yourself if you plan to keep them long term. Maybe design something similar to Termitat from kickstarter as those seem to work well (haven't had one, but maybe later this year. Someone here recently got one and it seems to work well). I think a test tube should be fine to start them in though, I don't see why not. Edited by Vendayn, May 13 2017 - 11:07 PM. Oh, cool! Damp wood termites are neat. 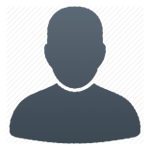 From images, it looks like it may be Neotermes castaneus. Thanks. Did you get any eggs from these guys? 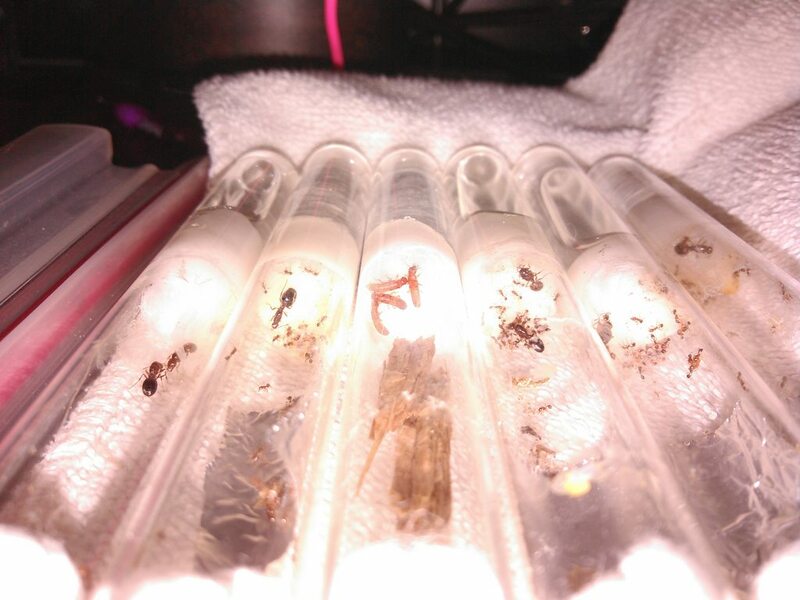 Pheidole megacephala in Fort Lauderdale or Orlando areas?